University professors and students are lending their expertise to local police departments looking for new ways to rebuild relationships and accountability with the communities they serve. The School of Social Work at the University of Maryland, Baltimore, is partnering with the Baltimore Police Department on community policing efforts while the College Park campus’ sociology department is working with the Prince George’s County Police Department to help officers identify their biases. Johns Hopkins University began a partnership with the police department to develop programs aimed at reducing violent crime in 2016, according to a university press release. Two School of Social Work projects are in the works. The first proposal will pair students from the school with officers working in four key “transformation zones” across the city. These zones are areas that had “elevated concentrations of gun-related crimes” in 2016, according to the police department’s website. The department intends to collaborate with outside organizations in these zones. The idea is that community-driven intervention strategies will reduce violent crimes overall. The Johns Hopkins Bloomberg School of Public Health is already working with officers in the transformation zone program, according to the police department’s website. 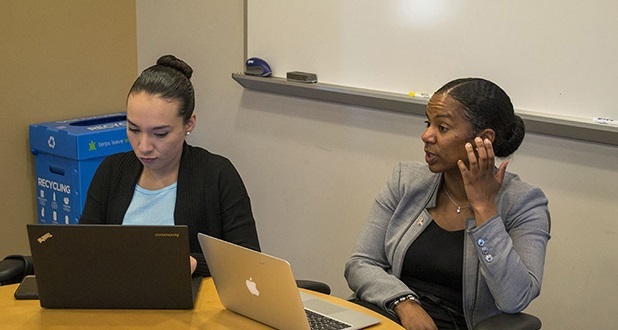 The goal of the University of Maryland proposal, Shaia said, is to be able to place one graduate student working as a community analyst in each of the four zones, with a fifth student overseeing the broader mission of the program across all the communities. The second project, said Richard Barth, dean of the School of Social Work, is a certificate program that would offer specialized training for police officers on community issues such as intimate-partner violence, suicide, youth violence, child abuse and neglect. Barth said that the School of Social Work surveyed officers to find out what they would want from a certificate. The survey received more than 600 responses, Barth said. Shaia said that addressing structural issues — including education, substance abuse, employment, infrastructure and access to housing — holds the key to beginning to tackle crime in Baltimore. The University of Maryland, College Park has been working with the Prince George’s County Police Department to develop simulation-based, virtual reality trainings to help officers recognize unconscious attitudes they bring to their policing. Dr. Kris Marsh and Dr. Rashawn Ray, both sociology professors at the University of Maryland, College Park, study implicit bias — prejudice that develops and plays out unconsciously. Implicit bias has been associated with differences in policing of individuals depending on their race, gender or sexual orientation. Marsh and Ray have created and begun offering classroom lessons on implicit bias for Prince George’s officers. Now, they are taking their research and merging it with existing virtual reality technology to show officers how their biases can show up on the streets. In 2016, the sociology professors approached computer scientists in the University of Maryland Institute for Advanced Computer Studies with a proposal to develop a virtual reality simulation to complement their teachings. “There’s some data that suggests that virtual reality has a longer-term effect than some of this two-dimensional kind of stuff that’s out there,” Marsh said. The Maryland Blended Reality Center, a collaboration between the university’s College Park and Baltimore campuses that innovates with virtual and augmented reality, embraced the sociologists’ challenge. It anticipates debuting the implicit bias trainings in March 2018, said the center’s associate director, Barbara Brawn-Cinani, who works closely with director Amitabh Varshney. Officers will wear headsets for training simulations, allowing for close detection of facial expressions of civilians they encounter in each scene, she said. Baltimore Police Sgt. Regina Richardson participated in virtual reality scenarios for the first time during her annual training in early December. She said she enjoyed the experience and was pleased when she performed correctly. “For something where we need to kind of just hold back a second to see what we have before we go blasting, I think it’s a good idea,” she said.